When Nan's book finally appeared on my Kindle I immediately dove right in. She has after all been the villain of Rosemary Beach and I was dying to see how Abbi Glines would make us all fall in love with her. But, if I'm being completely honest my feelings for Nan started changing the day she helped out Harlow. I couldn't help it because at that moment in the series we finally got a chance to see a completely different side to her. Yet, if Nan had been a like-able character from the start the Rosemary Beach series simply wouldn't have been the same. Let's face it, Nan has been the perfect mistress of drama. As the book starts out we see Nan and Major have a sort of friends with benefits thing going on, yet it's clear Nan wants more but is basically afraid of rejection and therefore doesn't push Major. She puts up with a whole lot of crap from him, something you wouldn't expect to see from a person like Nan. But maybe that's just it, maybe we don't really know anything about Nan. Like for instance her complete and utter unhappiness. She knows she's made mistakes, her pain and inability to control the actions that spring forth as a residual affect have alienated her from everyone. But she wants to change, she wants to do better. She knows Rush will always love her and now she has the unconditional love from her nephew Nate, but she wants more. Nan has literally watched everyone in her life find their HEA and she wants it for herself. Yes, Nan wants to be someone's Blair and honestly who can blame her. A weekend in Vegas to but some distance between herself and Major's philandering ways puts Nan on the path to meet Gannon a real man, one who's dark, secretive and dangerous yet Nan cannot help but feel drawn to him and safe in his arms. The affair doesn't last long but it changes Nan's life in ways she never sees coming. Will she go back to Major or will she decide she deserves more? Abbi Glines did a wonderful job crafting this story. She has given us two male leads who both see the beauty and strength of Nan beyond her bitchy exterior. One of these characters is ready to step up while the other one doesn't even realize he's in love with her until it's too late. This story is packed with a little bit of suspense and mystery and I can guarantee before the end you will be rooting for Nan because no matter what anyone's done in the past everyone deserves happiness and the love of a man who genuinely appreciates every single composition of their personality, all of it, the good and the bad. I thought this story was paced perfectly, I grew to love Nan and was in awe of her strength and self-awareness. If there was anything I found "annoying" it was her constant inner dialogue and obsession with how many calories something contained and how hard she would have to work out to burn those calories off. I found the constant mention of those things aggravating and for me personally it took away from her journey. 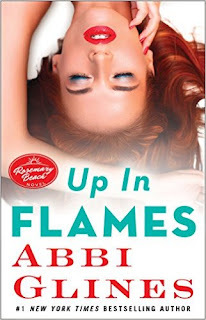 Up in Flames is a great conclusion to the Rosemary Beach series. While we don't get to hear from all of our favorite characters, Abbi Glines does give us a few opportunities to check in with just about everyone. Nan finds not only love but maybe also and more importantly joy and peace. I for one am sad to say goodbye to the Rosemary Beach series! Absolutely don't miss out on this book, give it no other thoughts, just one-click it today. Hi, i was wondering if you could spoiled for me who Nan ends up with? Please?!!! And also, does it have a epilogo like in the Sea breeze series?